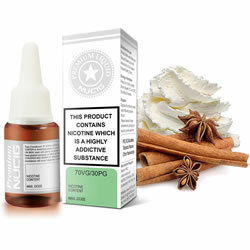 Try our Green label Cinnamon Cream e-liquid flavour, it is a perfect blend for the perfect vaping experience. 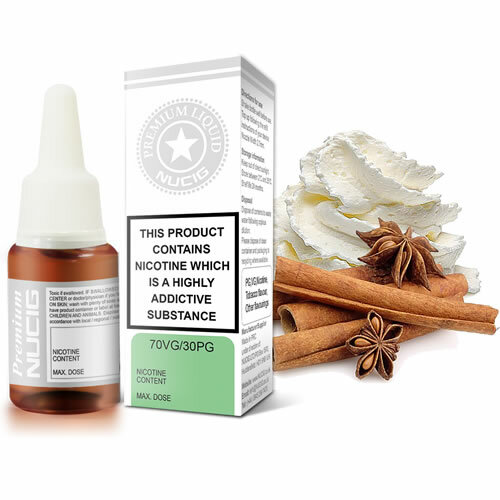 NUCIG Green Label Cinnamon Cream e liquid contains only the purest and highest quality pharmaceutical grade ingredients and is for those who prefer extra smooth draw. Exclusive MaxVol™ technology delivers a smoother, richer maximum volume smoke (vapor), providing a sweet aromatic cinnamon flavour. Specially formulated to extend the life of your electric cigarette atomiser, clearomiser and tank. As well as the NUCIG, perfectly compatible with ALL brands of quality ecigarettes. Nicotine liquid is TPD2 certified & GMC tested for quality, consistency and safety.